One of my favorite hanging plants is the Creeping Charlie. This plant also goes by the name Artillery Plant. It has creeping stems closely covered with round leaves and is suitable both as a hanging plant or as ground cover in large pots. The flowers are rather spectacular when in full bloom. They are white and have a very pleasant fragrance. They will flower in the spring and again in the fall. Light but no direct sun. Regular room temperature is fine. The soil should be moist. but the surface should be allowed to dry out before watering. Water less in the winter than in the summer. Feed every week in the summer and mist frequently. Give the leaves time to dry out before nightfall to avoid fungus diseases. Pinch back long stems for bushy growth. Cut the whole plant back in the spring. As most of you know that November 26th is shop small day. We would love to see you here on the 26th. Give that gift of a living plant to your loved ones. Love to see you all here. Mmmmm coffee. I love coffee, and I have at least one cup a day. You may have heard reports that coffee may be good for you. Hmmmm if it may be good for us how about our plants? Yep. Plants love coffee too and they thrive on it. Coffee grounds (and brewed coffee) are a source of nitrogen for plants, which is the nutrient that produces healthy green growth and strong stems. Coffee also contains calcium and magnesium -- both of which are beneficial to plant health. Next time you have a cup of coffee think about giving some to your plants too. If you have any black coffee left in your coffee maker dilute it and water your plants. They will love it if you do this about once a week. Don't throw out those grounds. You can mix those grounds into your compost pile. All though anthruiums are a tropical plant, it is a great plant for dreary winter days. They come in a variety of colors like red, salmon, white, pink, and even black. The blooms last for several weeks and can keep blooming all year with the right conditions. Surprising enough they are relatively easy to care for. Don't allow the plant to dry out but not soaked. They are a tropical plant, not one you will find in a swamp. Don't let them sit in water at any time. They will get root rot. Light: Bright, indirect light. Do not expose to direct sunlight, except in the winter or plants that have been carefully acclimated. Temperature: They suffer below 60ºF. The foliage types prefer it even warmer. Soil: Rich, loose potting media. Push exposed roots into the soil. Fertilizer: Use liquid fertilizer throughout the growing period or pellets in the spring. Divide during repotting, or take cuttings from the tip or stem. Older foliage plants might overgrow the top of their pots with exposed aerial roots. These can be cut off at the soil level and potted into new pots. Leaves will emerge from the old stem. Repot annually as needed. They don't suffer from being slightly underpotted, however, so only repot if necessary. When repotting, use quality potting soil. All anthuriums prefer plenty of warmth, regular moisture and ample fertilizer. Flowering anthuriums will flower any time of the year, providing they are healthy. 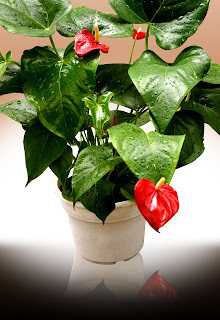 Foliage anthuriums are mostly found at speciality greenhouses or through online nurseries. To grow them best, approximate conditions found in tropical zones. There are some houseplants that are harder to kill than others. These plants make perfect beginner plants. I had a customer that came in a few years ago with a tale about how she tried to kill her golden pothos. She had this plant on top of her refrigerator for about ten years or so. She was getting tired of it and it was looking rather stringy so she took the plant and placed it into a garbage can she did not use often. Her main garbage can was too filled to add it. After several months and her main garbage can had to much to add any more, she opened the garbage can with the plant in it. To her surprise the plant was still alive! Feeling very guilty of doing what she had done, she replace the plant back on top of her refrigerator and to this day it is doing fine. The golden pothos vine is one of the most popular and dependable houseplants available today. Formerly known as Scindapsus aureus, these plants grow to giant proportions in their native habitats. They can easily swallow 100-foot trees, and their mature leaves are as broad as basketballs. In home cultivation, they are exceptionally tough, both easy to propagate and maintain. See Growers Tips below for special planting ideas. Light: Bright, indirect light. Under full sun, the leaves will lose some of their distinctive yellow marbling. Water: Keep the soil moist through the growing period. In winter, reduce water, but do not allow the plant to dry out. Temperature: They prefer warmth and will cease growing below about 55ºF. Soil: A loose, rich well-drained potting soil. Fertilizer: Use a time-release fertilizer at the beginning of the growing season, or use liquid fertilizer with every feeding during the growing season. Reduce fertilizer during the winter..
A well-grown golden pothos vine can easily overrun its container. They are also frequently planted on stakes or wood columns, so they can climb. If repotting is necessary, do it in spring, at the same time you take cuttings for new plants. These are excellent hanging plants, as they will rapidly form a cascade of brightly mottled yellow and green leaves and are not as fussy as many ferns. They can also be trained to climb wooden mounts or moss-covered sticks, although it's unlikely they will form the large, mottled and lobed leaves of their mature form. It's perfectly acceptable to cut back an unruly pothos vine. They are occasionally susceptible to scale insects, mealy bugs and mites. The spider plant is among the most popular and easiest to grow of all hanging or trailing houseplants. While these exceptionally hardy plants will survive in less than perfect conditions, in perfect conditions they are stunning. A mature plant will form tight rosettes of arching leaves with a profusion of hanging plantlets on long stems, up to 3 feet, somewhat like a bushy green mane. Although there is a pure green variety, the most common variety seen in garden centers in the green-and-white striped 'Variegatum.' Mature plants have small white flowers. Water: Water liberally through the summer. Mist occasionally. During winter, cut watering back. Temperature: Do not let fall below 50ºF or expose to cold drafts. Soil: Spider plants like fast-draining, well-aerated potting soil. Fertilizer: Feed weekly during the summer with liquid fertilizer or use pellets at the beginning of the growing season. Although it is a fast-growing plant, spider plants do not need yearly repotting as most of their growing energy is directed toward producing plantlets. Repot in spring if the root ball protrudes above the rim of the pot. Native to South Africa, spider plants are an essential part of any hanging plant collection. Pot them into simple baskets, provide it with ample water and food, and within two years, you should be rewarded with a full display. Alternatively, they can be positioned atop columns for a beautiful display. Note that plantlets will not form on immature plants. The most common problem is underwatering and feeding during the growth season—these are robust plants. The dracaena group is a large group of plants that range from the popular and tough D. draco to the somewhat ubiquitous Ti Trees, which have a distinctly false palm effect. Members of the Agave family, Dracaena are not difficult to grow, but vary somewhat depending on the variety. There are a number of popular cultivars, including: D. marginata; D. deremensis (narrow leaves with margins of white or yellow); D. draco (stiff, arching green leaves); D. reflexa 'Song of India' (lime yellow margins on green leaves); D. fragrans (wide, variegated leaves with a yellow mid-stripe, sometimes called Ti Tree). Light: They can withstand light shade, especially the Ti Trees or D. marginata. D. Draco can withstand full sun. Water: Water regularly; do not let dirt dry out. D. draco, however, can withstand drier conditions in the winter. Temperature: Most Dracaena prefer warmer temperatures of 65ºF and higher. D. draco is the sole exception, able to withstand temperatures down to 50ºF. Soil: Rich, well-drained potting compost. Fertilizer: Feed weekly or biweekly during the summer, or use slow-release fertilizer at the beginning of the season. Repot when necessary, usually every two years or when their potting media is exhausted. There are not generally demanding plants and will usually do well in shadier conditions than many other plants can withstand. With all but D. draco, however, it is important to keep the soil evenly moist throughout the year—they should not be allowed to dry out—and they do not thrive in drafty, cold conditions. The most common cause of collapse is generally too much water during the winter in combination with cold conditions. If the plant begins to show brown leaf margins, raise humidity by misting regularly. Have you ever thought of a natural way of cleaning the air in your home? Just think, no more using air filters and the costly replacements of the filters. These natural air filters also add to your decor and make your home much more homier. Plants act as natural air filters, because of constant intake of air through the leaves. All manner of chemicals and compounds then move through the plant and end up exiting through the roots. Bacteria and other microbes in the soil then digest or otherwise break these toxins down. It sounds ideal, but how effective are houseplants at really cleaning the air? A 2-year study done by NASA has the answers. Their interest in the concept is to find ways to keep the air in future space stations clean naturally. Common houseplants were enclosed in glass and exposed to measured amounts of various air pollutants, such as benzene and formaldehyde. All houseplants will clean the air to a certain extent but there are a few that really do a great job at scrubbing the air. After much research by NASA they have come up with these plants that do the best in filtering the air. To a lesser extent, also Dumb Cane, Spider Plant, Pothos, Philodendron, various Ficus species and Dracaena species. You'll need approximately 1 plant for every 10 sq yards (with average 9 foot ceilings) . So a typical living room (20 sq yards or more) would need 2 or 3 plants to help keep the air clean. Make sure that potentially toxic plants (like Dumb Cane) are out of reach of children or pets. So if you have a corner that gets a reasonable amount of light, you might want to think about getting an all-natural air filter in a pot. Plants won't clean things like cigarette smoke, dust or pet dander, though. You will still have to do a little bit of housecleaning for that. 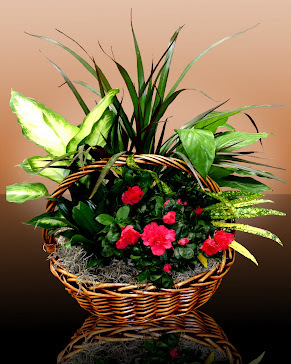 The most common of all of the collections of houseplants is the green foliage plants. Most flowering plants require full sun to produce their flowers. There are a few however that will do just fine in a house environment. Foliage plants tend to brighten the house as well as supply needed oxygen. Most houseplants are tropical plants and do not do well outside in too cold or too hot climates. That is why they make such perfect plants for the house. Not all houseplants require the same care. Some need more light or more water. Each is unique and present a wonderful challenge for the beginner as well as to the more advanced. It is an enjoyable hobby when one is able to see their little treasure thrive. I will be introducing you to some very common houseplants that over the many years have proven to be great in the house environment. We will explore plants like the ficus to the azalea. I hope you will join in and find you can take care of plants in your house. Just like humans, plants can get sick with a disease. Even the healthiest plant may be at risk from pests but, given reasonable good growing conditions, houseplants suffer from comparatively few diseases. Over watering, over feeding, excessive warmth or cold, poor ventilation, and lack of light not only prevent proper growth of a plant, but may also make it susceptible to attack by various fungi, bacteria and viruses. Many diseases caused by fungi or bacteria can be brought under control, but there is no defense against a virus. A fungus which lives on honeydew (excrement of of pests). Plants which are infested by these insects are susceptible to attacks. Symptoms: Black mould covers the leaves of the plant. Treatment: Wash leaves and stems with soapy water solution. You many need to rub leaves like shampooing your hair. Do not rinse the leaves after applying the soapy water solution. For more information on pest control check out Pests (Things That Bite). A fungal disease likely to effect begonias, codiaeum and Euonymus japonica. Symptoms: White mold on leaves and stems. Treatment: Remove the mildewed parts of the plant and spray with a fungicide. Water less frequently and give the plant better ventilation. These are the invisible enemies of houseplants. Symptoms: Varied, Leaves mottled with green ad yellow patches, stunted and distorted. Causes: Infection by a virus, possibly carried by insects. Treatment: Nothing can be done except to discard the plant to prevent infection of other plants. Also throw away the compost. Never use it again. A fungal disease to which the root is effected caused by over watering. Symptoms: Plant is wilting with leaves shriveling and turning brown. Treatment: If the plant is too far gone throw it away. Otherwise repot it. First, remove all dead foliage and then, using water, wash all the compost from the roots. Cut away any roots which are brown, soft and mushy. Repot the plant in fresh compost which has been watered with a fungicide. Water sparingly and infrequently until the foliage has picked up. For more information on watering check out Watering Your Plants. I will only list one hard body pest because it is the most common of all the hard body pests. These are pernicious little sucking insects that are hard to detect which haunt the underside of the leaves. The young start out as a soft body insect and the harden when they become adults. By a preventative solution of soapy water once to twice a month will help control all pests even the hard body pests that are the hardest to kill. Symptoms: Yellow spots on leaves. The whole leaf may yellow and fall off. Growth is stunted, Young scales are translucent and hard to see, but they can be seen and felt as immobile colonies of the build up. Sooty black mold may be found growing on their excrement, which is called honeydew. Adults are more noticeable. They turn black and usually hang out on the stems of plants while their children hang out on the leaves. Treatment: If you catch them early the insects can be scraped off with a thumbnail. Then wash around the area where the scales were with soapy water, to dislodge any eggs or young. If the insects are well established, spraying with malathion or cythion will kill the young scales which have not grown protective shell. To kill mature scales apply a systemic insecticide powder to the compost. We always feel we need to get rid of all insects from our dear little plants. But not all insects are bad to a point. Certainly not a pest. Worms are among the outdoor gardener's best friend because of their role in aerating and fertilizing the soil. Indoors in a pot maybe a nuisance, but there is no reason why they should be. But if you feel you need to get rid of them by all means do so. Treatment: Remove the plant from the pot and if you see any worms in the compost pick them off and leave them in the garden to do their good work there. When it comes to getting rid of pests and diseases, remember that none of the thousands of chemical preparations sold to gardeners is safe. All are intended to kill something, In doing that, some may damage the plants themselves, or harm animals or humans. Are you interested in a more natural way of getting rid of soft body pests? The simplest and the most successful is made up of products you already have in your house. Here is the formula I personally use for my own plants as well as the plants in the nursery. If you don't already have purchase a large spray bottle. Take about one tablespoon of dish washing liquid (Do not use Dawn. This product does more harm than good) and pour into your spray bottle. Next, add water to the top. Take your plant to the sink, bathtub, or outside. With your spray bottle, spray the plants top leaves as well as the underside. Make sure you get the stems as well. You can also rub the leaves just like you are washing your own hair. Leave the soap on. Do not rinse the soap off. Once the soap is dry the soap will dry out any soft body pest. For preventative purpose, do this as often as once to twice a month. One of the most common and most frustrating insect is the aphid. It has been estimated that one aphid is capable of producing ten million offspring in three months. Symptoms: It is hard to miss the clusters of green, black, brown or yellow squashy insects busily sucking the sap from the tender growth of the plant, leaves, buds or flowers. Ants may be present, feeding on the insects' honeydew, which also encourages the growth of sooty mold. Treatment: Spray with soapy water for a more natural killer and deterrent. For chemical use malathion or cythion it it is a bad infestation. Watch carefully that no aphids have escaped to recolonize. Some aphids attack roots and these are hard to spot until it is too late to save the plant. However, if you suspect an attack use a systemic insecticide. These pests are so small that only a plague of them become obvious. They flourish in a hot, dry room and given these conditions almost every plant should be considered at risk. Symptoms: Tiny, straggley webs and whitish powder (the skins of dead mites or shedding) on the leaves are convincing signs of their presence. But by then the mites will have been voraciously sucking the sap and the leaves will be speckled with yellow spots and starting to fall. Treatment: Spray with soapy water and keep repeating the treatment for several days till the eggs have hatched and died. If infestation is too bad a malathion or cythion spray might be more effective. Caution! The plant may be already too weak to use these products. Try first the soapy water treatment before using any chemicals. Related to scale insects, these pests are not as successful in concealing themselves because of their white waxy covering. Symptoms: The appearance of white fluff on the stems and leaves is the first sign of an attack. This is the coating around the bugs. They reproduce rapidly and soon the mass sap-sucking makes the leaves turn yellow, wilt and fall. Their honeydew is a breeding ground for fungal diseases. Treatment: Spray with soapy water and keep repeating the treatment for several days till the eggs have hatched and died. If infestation is too bad a spray of malathion or cythion may be more effective.Attacks by mealy bugs at root leavel are harder to detect, but if sympooms suggest an infestation turn the plant out of the pot. Look for the presence of masses of white eggs and bugs. Use a systemic insecticide. I have many people come into the nursery with their poor sick plants. They are desperate to find out what they are doing wrong. I have put together a few of the most common symptoms that may help you out with figuring out what could have happened. Symptoms: The leaves have turned yellow and are falling. Cause: Since the plant has been left standing in a saucer of water, this is a simple case of gross over watering. Treatment: Pour the water out of the saucer immediately and never let it accumulate again. Permitting the compost to drain properly after watering is as vital as getting the compost thoroughly wet in the first place. This applies to all plants, with the rarest exceptions, such as the umbrella plant, which thrives when standing in water. Compost which has become waterlogged should be allowed to dry out until it is barely moist before you water again. Symptom: The edges of the leaves have turned brown during the dormancy period (during the winter). Cause: This is a common reaction to over watering during the winter. Treatment: Let the compost dry out thoroughly and then reduce the frequency of watering while the plant is dormant. During the spring and summer months the plant may be watered more frequently, but in the winter months the compost should be barely moist for most of the time -- except just after watering. Don't be surprised if leaves which have turned brown as the result of over watering soon drop off. Symptoms: Leaves look dull and lifeless. Cause: They are covered with dust and grease which is slowing down photosynthesis and clogging the stomata in the leaves through which the plant breathes. Treatment: Wash leaves with a mixture of one cap-full or one tablespoon of dish washing liquid with water into a large spray bottle. Please do not use Dawn. Dawn will do more harm than help. Take the plant to a sink and spray on the top of the leaves as well as the underside. You may even want to rub the lather in like shampooing hair. Rinse with water. If necessary repeat. To keep leaves clean, do this about once a month. Symptoms: If you have a plant for many years and the leaves are turning yellow and die it maybe from old age. Cause: Natural causes and, for once, in no way your fault. Leaves do age and die, as eventually the whole plant must. Now that you have purchased your little treasure you will need to learn how to water it. Each plant is different even the same kind of plant is different. Just like our own children, their needs are different from each other. The most common problems are over watering. Yep. We love our plants so much, and we want to make sure they have all the water they need. In the wild plants will get water when Mother Nature gives it to them. In our own yards we tend to allow our plants to dry out before we water. But when we have plants in our house we over water. The best thing for your plants is to not pamper them. We all take in water differently just like our children and ourselves. We don't put our children or ourselves on a watering schedule so we should not put our plants on a watering schedule. You can have the same exact plant in your house and one always seems to need water, while the other never seems to need it. OK now you are asking how do I water them? Now this will take some time but will be well worth the effort. In the morning while you are drinking your morning coffee lift your plants. If it is light water it. If it is heavy don't water it. That is it. Now that you have a plant that needs watering how do you do it? Here is where over watering can happen. If you water your little treasure where it is and allow the water to pool in the saucer you will over water it. The best way to water is to take your plant to a sink and allow the water to pour on it till the water runs out of the holes on the bottom of the pot. After you finish watering allow the plant to sit in the sink for a few more minutes to allow any dripping to stop. Now you will be able to put the plant back in the spot you had it. Some of you will be asking how do you water large plants that are too heavy to lift and take to the sink or bathtub? This is one of the biggest problems. The best way to do this is to make sure the top two inches of the soil is dry. Then take a cup or a large container full of water and slowly pour the water in till you see water coming out of the bottom into the saucer then stop. Most larger trees and plants don't need to be soaked. How ever if you are able to take the large plant outside at least once a month you will be able to soak it then. Watering garden baskets can be tricky. Garden baskets do not have holes in the bottom of the basket. What we do here at May Day Nursery is we plant a spath or peacelilly in the basket. This little plant will tell you when to water. It will start to droop. Now to water the basket you will pour a cup at a time. Depending on how large your basket is will determine how many cups you will add. So pour one cup in and let it set for about 15min. then, if needed, add another cup and again wait for about 15min. Continue till the soil is moist not wet. Now you know how to water your little oxygen maker go and water. Have you ever gone into a nursery and found yourself not sure what you want? You thought you knew but when you entered you found there were too many to choose from. You wonder the isles looking at some with flowers and some just foliage. Oh what to buy! Here are some pointers to help you on your way to buying that perfect plant. 1. Figure out what kind of lighting you have. Is it low, medium, or very bright. Does the sun shine through the window you want to put a plant or is it filtered. a. Low light - is very hard to find a plant that will grow well in low light. All plants need some kind of light to make food. You may want to try a pothos or a rubber plant. Make sure the light is not so low that the plant will suffer. If it does move the plant to a location that has more light. b. Medium light - this is a little better but not the best. There are more plants available for you to choose from. You may try a pothos, rubber plant, spath (peace lilly), creeping charlie, wondering jew. c. Bright indirect light - this is the best lighting. You will be able to buy any house plant. 2. Now that we have established the lighting lets figure out what kind of plant you want. Do you need a plant to fill a large spot? How about one that will sit on a table? Or maybe you need something that hangs? Do you want a plant that flowers or all foliage? Or my favorite a garden basket of an assortment of lovely plants. 3. OK now the big one. How much do you want to spend? Plants can start as low as $3.00 for an african violet to $150.00 to a palm. Be sure that the plant you want to purchase it perfect for your lighting. Now that you know what you want go out there and put some oxygen in your house. 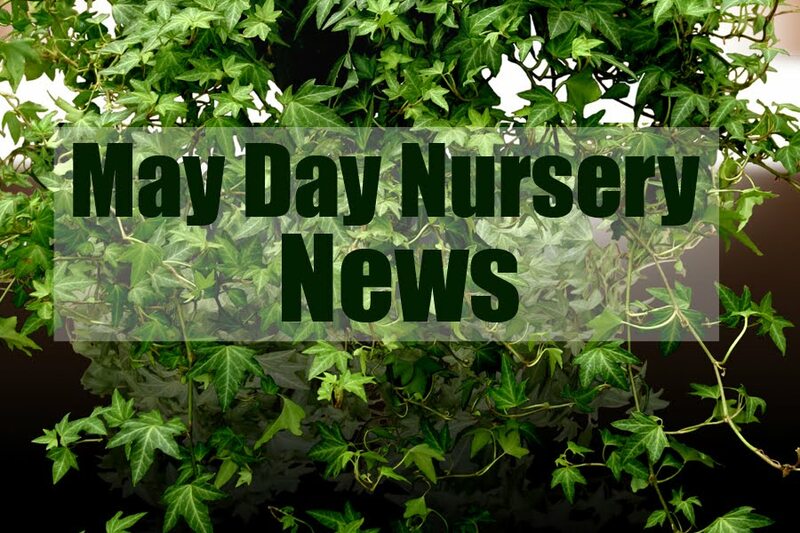 Announcing the opening of May Day Nursery. As of November 1 2011 Murillo Nursery is now May Day Nursery. We will still be giving you the same quality plants and service as before. Please drop by or give us a call 209.537.2736.